September 2006: My name is Maryjane. I wrote in the Love Canada Geese Guestbook about a week ago. I live off of the Delaware River in Pennsylvania, near New Jersey and Delaware. 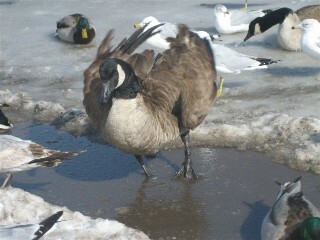 I am very fond of Canada geese. I'm getting to know each of them by their personalities. There are two injured geese on the river where the flock comes to get food. Pogo has a broken foot. The other one has a broken wing. I am very worried that they won't be able to fly and will freeze when the winter comes or be attacked by predators like the seagulls that hang out at the river. 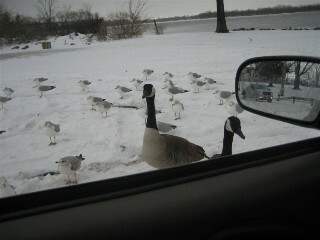 They attack the geese for their food. Is there any waterfowl rescue in my town that can save these geese? I feed them everyday but I know they're in for danger. February 15, 2007: We had a snowstorm. Yesterday, I was having a bad day so I decided to see if I could feed my friends and to my surprise, most of the flock was on the river side and ready to be fed. They came right up to my car window. Although I had some difficulty with the seagulls, I got to feed them a little something and it brightened up my day. February 21, 2007: I saw Pogo last week. He is in pain but is a true survivor. He has been around since the summer. He is very fond of me. 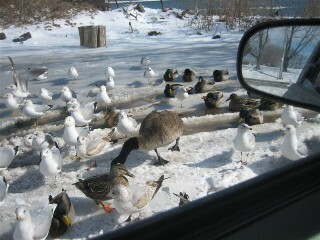 There are about 300 geese here in the winter and about 1,000 in the summer. February 26, 2007: Do mated pairs nest in the same spot every year? (Yes, they do, as long as their nest site has not been destroyed or taken by another couple. They may select a better spot if they're able to find one.) The reason I ask about them nesting is because that's how I began to get to know the geese and love them. I'm looking forward to spring when I can go to the river bank in the back of my house. The geese often graze right by my deck. I live about 50 feet from the river's edge. Saturday was nice so I went to the bank of the river because it was low tide. There were about 10 geese in the water so I fed them. One particular goose fed from my hand. I remember his markings from feeding them at the fish hatcheries a mile down the road. He is rather small so I named him Teenie. Teenie feeds very close to me. When I finished feeding them, I started walking away and Teenie followed me. I bent down to tell him my food was gone and he put his beak near my hand. It really made my day because they're usually too intimidated to come close. March 3, 2007: I witnessed a goose fight between two ganders yesterday. Why do they fight? (mating season, battle for choice nest sites, showing off for their beloved) I tried to break up the fight but I was a little scared. The rest of the geese circled around, honking. They have been really aggressive for the past couple of days. When I fed them the other day, they treaded on my feet and allowed me to pet them. That is rare because they usually come only so close. Pogo was there as well. I stayed to watch them leave for the night and Pogo remained for about five minutes, then he flew off. I think he is a loner. He seems to get picked on by the other geese but is a survivor. He has been around for about a year. I hope his foot will get better. March 12, 2007: I have terrific news! Pogo found a mate! I went down to the river's edge this afternoon and there were two geese there by themselves. Earlier in the day, there was a lot of honking going on outside so I figured they were arguing. They've been doing a lot of that lately. I walked down to the riverbank and the two geese swam up to me. To my amazement, it was Pogo with a beautiful mate whom I named Mimi. I was overjoyed. They chased away the other geese and I have a feeling they're trying to claim the nesting site that Poppy and his mate had used last year. March 16, 2007: I named a funny new couple Big Bob and Betty. Big Bob is rather large. Betty just seemed like the right name for Big Bob's mate. They dominated the flock. Any other goose that tried to feed was bitten or scared off. My mother and I couldn't stop laughing. The only time the others were able to feed was when Big Bob and Betty went out and preened and bathed themselves by rolling upside down in the water. Pogo and Mimi are fine. I see a whole different goose now he has a mate. Before, he seemed timid and lonely. Now he's brave and proud.